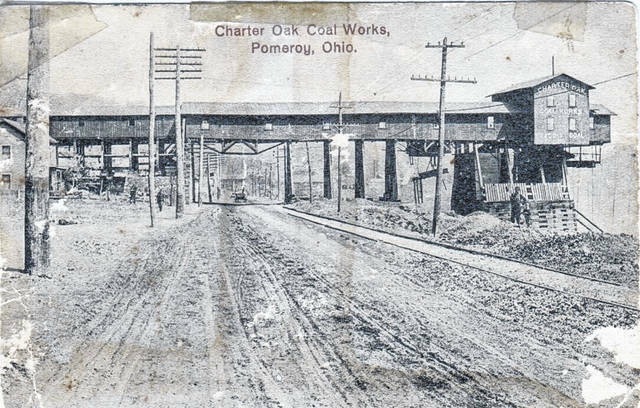 This post card photo from 1911, from the collection of Marge Reuter, shows the Charter Oak Coal Works in Pomeroy. According to the notes on the back, the man and boy pictured on the far right of the photo are Mike Bentz and “Pa Hannahs.” The coal works operated until around 1950 in Pomeroy. https://www.mydailysentinel.com/wp-content/uploads/sites/14/2018/10/web1_10.25-Charter-Oak-Coal_ne2018102415034460.jpgThis post card photo from 1911, from the collection of Marge Reuter, shows the Charter Oak Coal Works in Pomeroy. According to the notes on the back, the man and boy pictured on the far right of the photo are Mike Bentz and “Pa Hannahs.” The coal works operated until around 1950 in Pomeroy.